Welcome to the noisy and dangerous Mos Eisley Cantina on the desert world of Tatooine! Park the landspeeder and enter, staying clear of the giant dewback drinking from the trough outside when using the LEGO Star Wars Mos Eisley Cantina. Make sure Luke, Han and Obi-Wan have their weapons with them as they enter through the sliding door and walk past the droid scanner. Open out the building for easier play and order a drink while the Bith cantina band gets ready to play their instruments. Recreate scenes in the cantina from Star Wars: Episode IV A New Hope, such as the showdown between Han Solo and Rodian bounty hunter Greedo. 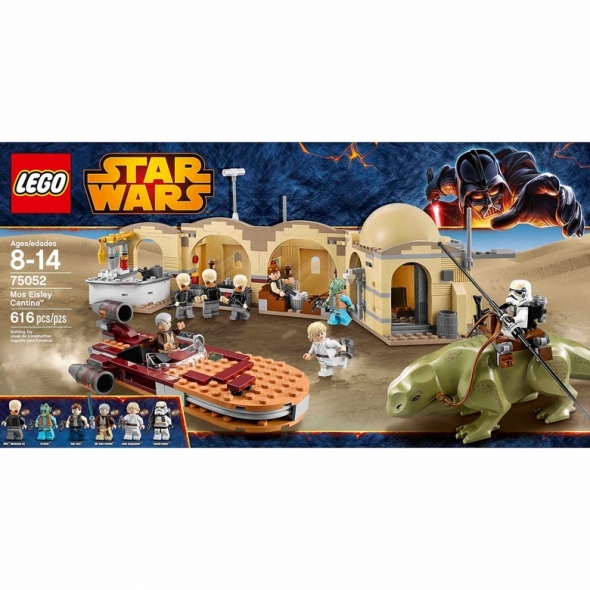 The LEGO Star Wars Mos Eisley Cantina includes eight minifigures with assorted weapons and accessories: Han Solo, Luke Skywalker, Obi-Wan Kenobi, Greedo, a Sandtrooper and three Bith Musicians.